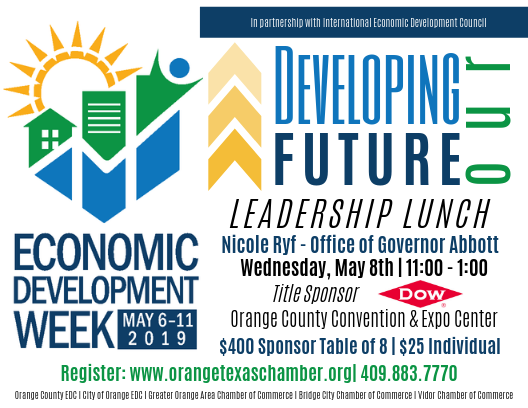 In recognition of Economic Development Week the Orange County EDC and local Chambers of Commerce present Developing Our Future – Leadership Lunch and Economic Development Presentation. Economic Development Week increases awareness for local programs that create jobs, advance career development opportunities and increase the quality of life in communities like Orange County. Sponsorship’s available at $400 for a table of 8 which includes Program Recognition and Preferential Seating. Individual tickets are $25.